Sandra Williams thought her heirloom jewelry was gone forever, but she didn't count on the good will of Bonnie Patton. Williams accidentally donated a bag of Tiffany jewelry, including necklaces and solitaire engagement rings worth over $40,000, when she sent a box of clothing and other items to the local Goodwill Store. A banking executive from San Mateo, California, Williams had work done on her apartment in the spring and sent some items for donation at that time. When she first noticed the jewelry was missing, Williams went through the entire apartment looking for it, but then began to suspect that a member of the construction crew had pocketed them. She lodged a complaint with the company, contacted her insurance agent and called the police…and then she remembered the bags that went to Goodwill. Williams contacted the Goodwill store and filed a mistaken donation report, but she was cautioned that the charity receives in the neighborhood of 25,000 items a day, and chances were not good that something the size of solitaire engagement rings would be found. But luck was with Williams in the form of Bonnie Patton. Patton began to scream when she found the first piece of jewelry, and proceeded to shake every bra and pair of underwear in the bag to make sure she got it all. Patton was nearly homeless when she began working a temporary job at Goodwill after searching for two years for employment. She lives in Millbrae, California and supports three generations of her family. After her display of honesty, she has been promoted to a regular, full-time position. Williams wanted to give Patton money as a reward, but that is against Goodwill's rules. Patton insisted she was just happy that Williams got her heirlooms back, and no reward was necessary. Williams, who was amazed that no one pocketed the 1.75 carat diamond ring or any of the other pieces, was permitted totreat Patton to dinner to say thank you. 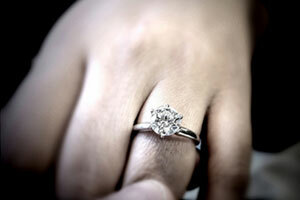 Like Williams, many people hide valuables, such as solitaire engagement rings, in their underwear drawer. Others stash money or jewelry in between the mattress and box springs in the bed, inside a plastic bag in the toilet tank or bury them in the backyard. Others put their diamonds on ice and keep them in the back of the freezer or in a cookie jar. Some enterprising folks have made hiding spaces in stereo speakers or inside an old computer tower. However, some of these hiding spaces could still fall prey to unintended donation, so purchasing a good safe is probably the best bet for storing your mother's and grandmother's solitaire engagement rings and other family treasures. Juno Jewelry provides a certificate of authenticity with every ring we sell, which makes filing insurance claims easier if your valuables are lost or stolen. Visit www.JunoJewelry.com for more information.